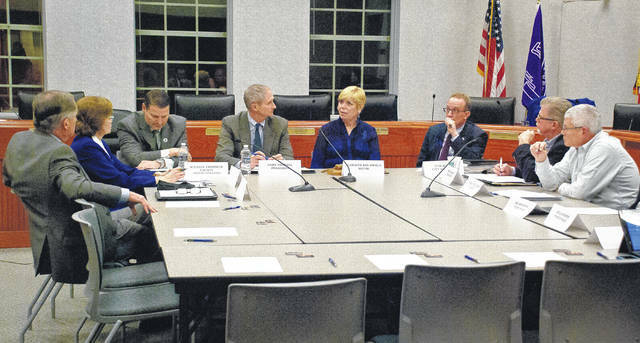 Delaware City Council met in a joint session Thursday with the Delaware County Commissioners. Pictured, left to right, with his back the camera is Commissioner Jeff Benton, Commissioner Barb Lewis, County Administrator Michael Frommer, Commissioner Gary Merrell, Mayor Carolyn Kay Riggle, City Manager Tom Homan, Vice Mayor Kent Shafer and City Councilman George Hellinger. Delaware County Commissioners were welcomed into the Delaware City Council Chambers Thursday by Mayor Carolyn Kay Riggle and city council for a special joint session. “We’re pleased to be here and looking forward to this,” said Delaware County Commissioner Gary Merrell. The first topic of the joint session was the reimbursement agreement for the city’s EMS (Emergency Medical Services) from the county. City Manager Tom Homan said the EMS reimbursement issue is something that keeps coming up. He said there had been discussions in the past about the EMS agreement, but then negotiations for Sawmill Parkway started and sidelined the EMS discussions. In 1971, the board of commissioners established a o.5 percent sales tax to fund emergency medical services. The coalition sought to end what they saw as a duplication of EMS services between the county and the coalition. The coalition wanted to contract with the county to be the sole first responders in their coverage areas. Homan said the city was looking to restart past conversations on the subject of EMS reimbursement from the county because they were going well until they got sidetracked. The commissioners pointed to County Administrator Michael Frommer, Assistant County Administrator Si Kille, and EMS Chief Mike Schuiling as the people that would need to be involved in the negotiations. Riggle said the city had sent a letter to the county last week about county funding for the Point Railroad Bridge Replacement Project. The $25 million project aims to relieve the traffic bottleneck at the intersection of U.S. Route 36/State Route 37 on the east side of Delaware. City Council approved an ordinance in November appropriating nearly $1 million for preliminary engineering services for the project. The multi-year project is expected to take until 2024 to complete. When Riggle asked if there were questions about the letter, Commissioner Barb Lewis said the dollar amount was higher than expected. Vice Mayor Kent Shafer said he saw the project as more of a regional project with the talk of development along the U.S. 36/37 State Route corridor. “The Point is a big issue with that transportation corridor,” he said. Merrell suggested the conversation be moved to the meeting with the county engineer next week. Transportation Improvement District Partnership Opportunities was the next item on the joint session’s agenda. Benton said there were 33 counties in the state that have set up Transportation Improvement Districts (TIDs). Benton said it is a streamlined process so things can be done faster, save money, and has the power to require utilities to move their utilities at their expense. The city approached the heated topic of public parking with the commissioners with a Memorandum of Understanding (MOU) regarding Delaware County parking facilities. Homan said the hangup was over the use of the garage space of the new courthouse. Shafer jumped in and said he sees the garage space as being off the table at this time with the county, but suggested giving it couple a years to see how things go. “That would be my suggestion,” said Lewis. Merrell said in one of the versions of the MOU, he asked that the parking just north of the commissioners’ building be removed from the public parking list because it’s where the 911 personnel park at night. “We just thought that at some point in the future there might be a point that the county would consider (the garage), but that’s not the case now,” Homan said. Also discussed in the joint session was the county and city sewer master plans, and the corresponding service agreements. Blake Jordan, city utility director, said there is a lot of development going on in the southern portion of the city, but the next steps would be to open up conversations about the northern area and setting up the boundary lines for infrastructure. The session also lead to the discussion of the continued economic development work between the city and county on the development of US 36/ 37 State Route corridor from I-71 and the Entrepreneurial Center agreement with Ohio Wesleyan University, which both entities have passed resolutions to support. This entry was tagged D. Anthony Botkin, delaware, delaware county, Joint Session, ohio. Bookmark the permalink.